Hillary Clinton has staved off countless rumors about her health in the past month, and the bout of pneumonia that forced her to leave a 9/11 memorial event this weekend only compounded people’s concerns. The Democratic candidate had no choice but to address the matter, and she just did it in a big way: At a campaign event this morning, Clinton ripped out her femur on stage and proved that it is unbreakable. Okay, so this is pretty much a masters course on how to take control of a story. Speaking in front of hundreds of assembled members of the press and supporters, Hillary unquestionably debunked comments about the fragility of her health by tearing her thigh open and wrenching her femur out. 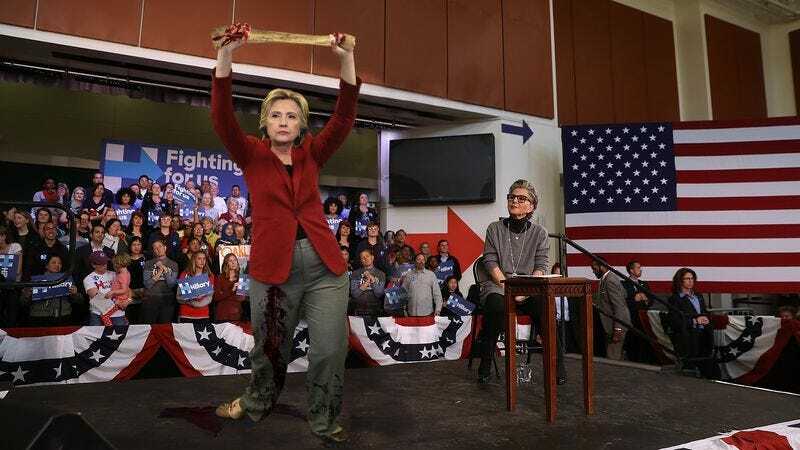 Immediately after freeing it from her leg, Clinton began to aggressively smash her femur against the speaker’s podium for several minutes to demonstrate its vitality. While the podium was severely dented and splintered, Clinton’s femur remained totally unscathed. Wow. If anything, the way Hillary handled this debacle only makes her look all the more fit for office. Clinton even went as far as inviting a reporter from the audience to try to break the femur himself. After failing to do so with his hands, the reporter took one last crack at the bone with a sledgehammer handed to him by a Clinton campaign aide. He brought it down on the femur with all the strength he could summon, only to find it fully intact afterwards. The Trump campaign has remained silent about Hillary’s strong femur, which suggests that her medical condition is no longer a viable talking point for Republicans to hit. Needless to say, this is an impressive win for H.R.C. Only a politician like her could take a potentially detrimental controversy and turn it into an opportunity to show exactly how ready she is for the Oval Office.